Clay Sutton, Glen Davis, and I conducted bird surveys off Atlantic City today, and as Mike mentioned (below), we had a reasonable amount of northbound waterbird migration, primarily Surf Scoters and Northern Gannets, with all of the latter being adults looking quite spiffy in their yellow, white, and black. Also northbound and clothed in spiffiness were the below three Great Cormorants just off Ventnor. and Long-tailed Ducks (behind the American Black Ducks). 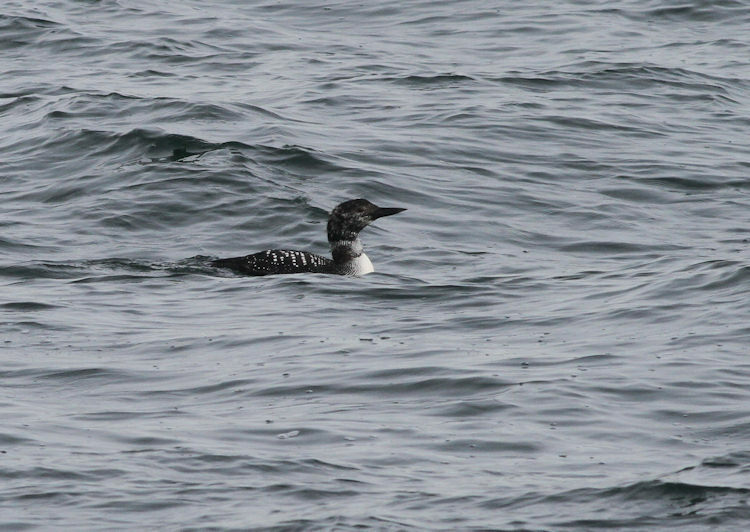 It is getting quite easy to determine relative age on Common Loons now, as the older birds are all molting into alternate plumage, while the not-quite-one-year-olds are still in juvenal plumage, with no suggestion of getting spiffy, as in the bird below. Note that on this bird, one can see the pale fringes to all of the upperparts feathers, the single best indication of juvenal plumage. We did see a few adults in apparently full alternate plumage; I would suspect that those will be leaving shortly, as was the alternate-plumaged Common Loon that Clay and I saw at more than 200 feet above sea level heading north. A real feeling of Northbound migration was much in evidence at Cape May Point for our morninig walk today. With little wind and a bay like a sheet of glass, the view of Red-throated Loons spread right across the landscape was fabulous and the good viewing conditions allowed us to pick out a whole bunch of other stuff too. Best find was two Razorbills heading out of the bay, but we also found three Forster's Terns, a total of eight Horned Grebes and a good scattering of scoter and Long-tailed Ducks. But it was the obvious northbound movement of migrant species that really caught the eye. Laughing Gulls, Northern Gannets and Double-crested Cormorants were clearly on the move today, as were both Snowy and Great Egrets; indeed, as I write, Great Egrets are still trickling past my office window periodically. Duck numbers remain low on the state park ponds, though there's a good scattering of Green-winged Teal out there. At least 10 Wilson's Snipe flushed along our route and Dark-eyed Juncos were feeding up before heading north, with several of them in song. See our Field Trip Reports page for full list of species. Things are definitely looking up for CMBO morning walks - so come on down, you don't even need to book in advance! Other news this morning: Bill Boyle reported the Common/Eurasian Teal still at Heislerville and two Black-headed Gulls at East Point, Cumberland County. Tony Leukering reports good passage off Atlantic City of Laughing Gulls, Great Cormorants, Red-throated Loons and Red-breasted Mergansers, plus a flock of 21 Razorbills four miles out (I hope Tony is on a boat!). Slightly belatedly, I should also mention a Blue-gray Gnatcatcher at the Northwood Center yesterday afternoon, found by Hank Burk. Up at Ocean View on Route 9, at least 20 Tree Swallows were at Magnolia Lake on Friday and the same day, Scott Whittle had a Piping Plover on the beach near the Cape May Ferry Terminal; Tom McParland reported the somewhat unusual sight of an American Oystercatcher on the concrete ship and a Glossy Ibis paid a fleeting visit to a roadside pool at the Beanery on 24th, to be replaced a little later by a Lesser Yellowlegs. On the same day, a Snowy Egret was along Reed's Beach Road. A Laughing Gull on the Maurice River on Saturday per Dave Lord showed that the summer chuckler continues to head north. Have I opened the flood gates now?! Karl Lukens just took this photo of a - yes, you guessed it - male Pine Warbler at his feeder down here near Cape May Point. When you get a sudden arrival of random photographs from folks, it's always nice to use them - but finding a way to tie them in to a blog post subject is not always easy. Having just received some great photos of Northern Gannets feeding in the Delaware Bay from Cindy Ferguson, I wondered how I could tie them in with the Pine Warbler pictures that I was sent by Pat Sutton. Pat and I had been talking about Pine Warblers on Friday, as there has been a nice male visiting the Northwood Center feeders for several days now, and Pat told me that she and Clay had seen a Pine Warbler visiting their feeders too, since March 14th. Then the link struck me; feeding opportunities! Many species of birds are successful because of their opportunism and their willingness and ability to adapt. Pine Warblers are - like all American Wood-warblers - essentially insectivores, but they are one of the earliest migratory members of their family to arrive back on their breeding grounds and no doubt regularly find a shortage of insects during the often chilly days of March. Being able to adapt thus enables them to continue to arrive early; there's a fair chance that your first Pine Warbler of the year that you actually see (rather than hear singing in the top of a pine) will be feeding on the ground. Almost certainly, it will be picking up pine seeds that have dropped from the cones over the winter. Similarly, the Pine Warblers at our feeders are mucking in with all the other birds and getting by on a variety of seeds - I haven't seen if our Northwood bird is showing a particular preference, but Pat & Clay's bird apparently favors sunflower hearts. Male Pine Warbler eating sunflower hearts at a feeder in Goshen [photo by Pat Sutton]. Male Pine Warbler eating sunflower hearts at a feeder in Goshen [photo by Pat Sutton]. As males of many migratory species head north to establish territories before the females arrive, it will likely be males more often than females that indulge in feeder feeding. So what about the Northern Gannets? Well, they're opportunists too, but perhaps in a more obvious way. Northern Gannets have to be visual hunters to find their food - fish that live underwater (actually, there's another phrase for Tony - underwater. Fish don't live under the water, they live in it!!). So they will check out any visual clues that might come thier way. This must surely include more than just spotting the fish themselves, as gannets will surely soon learn to keep an eye out for other gannets feeding, or even other bird species, mammals such as whales, and even large predatory fish such as tuna and sailfish. So it doesn't take a Northern Gannet long to work out that all those gulls are following that boat for a reason! Fishing boats are, of course, worth checking, as the crew may be cleaning the catch and throwing the waste overboard. But any boat will churn up water to a greater or lesser degree and this can bring up potential food items from deeper water, or simply attract fish, which in turn attract birds. ﻿As a short Post Script, you might be interested to know that the first record of a Yellow-rumped Warbler in the British Isles was of a bird visiting a garden feeder in Devon, SW England from January 4th to February 10th 1955. Sadly it was picked up dead on the last date, but it was clearly doing its best to adapt to a decidedly unfamiliar experience! Chris Vogel has been seeing an adult Black-headed Gull in the East Point, Cumberland Co., vicinity for over a week now. However, Clay Sutton just let me know that he saw two adult Black-headed Gulls, one in full alternate plumage and one in full basic, at Heislerville WMA yesterday -- along with 80 Bonaparte's Gulls. They were on the bay side at the outflow from the main pool that is being drawn down. The local low tide today will be around 10 am. A first year LITTLE GULL was seen in the company of an adult BLACK-HEADED GULL at Miami Beach in the Villas on Monday, March 21st, 2011. Another adult BLACK-HEADED GULL was observed at East Point in Cumberland County on the same date. 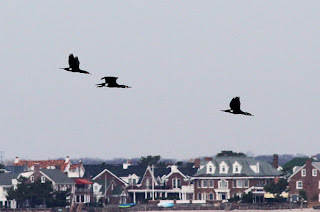 A CACKLING GOOSE was seen with a flock of Canada Geese flying over Cape May Point on Friday, March 18th, 2011. An “EURASIAN” TEAL was noted at the Heislerville WMA, and was last reported on Friday, March 18th, 2011. The following are First of Spring arrivals for 2011: GLOSSY IBIS, 3/19; CLIFF SWALLOW, 3/20; SNOWY EGRET, 3/21. There are many phrases that people say so frequently that few of us actually think about the words and what they mean put together in those phrases. Some such phrases are idioms, expressions whose meanings are not predictable from the usual meanings of their constituent elements -- such as "I'll pick you up at 3:30" (or the British version, "I'll knock you up at 3:30") -- the phrase is not used to indicate that the speaker is actually going to bodily pick up the listener, at 3:30 or any other time. However, other phrases have just come into being incorrectly and their use has been perpetuated by most of us without parsing the phrase to understand it or correct it. This essay is about those types of phrases, specifically those related directly to birding. The most commonly-used and widespread phrase that is used indiscriminately is "pair of binoculars." Raise your hand if you've ever really contemplated that one; I will bet that there are very few hands in the air. Let's parse the phrase, shall we. "of" is a preposition that indicates in this case the items that make up the "pair." "binocular" is the tricky bit here, as the word is usually used in an adjectival sense, nearly always modifying "vision." However, since it's part of the prepositional phrase "of binoculars" that is modifying the noun "pair," we're obviously not using "binocular" in the sense of vision. Let's take a closer look at that word. It is composed of two parts, a prefix "bi" that indicates two -- bipolar = two poles; bi-weekly = twice a week -- and "ocular," which in this sense is referring to the lenses at the end of the equipment in consideration that one generally puts up to ones eyes (the ocular lenses; the lenses at the other end are the objective lenses). Thus, "binocular = two oculars." or, if we do the multiplication, we have four oculars. (I bet that you didn't expect an essay on words to delve so deeply into mathematics, did you?) But, to have four oculars, we would have to have two of those far-seeing optical devices made by companies such as Leica, Swarovski, and Zeiss. That is because there are only two ocular lenses on those tools. So, we come to the gist of the essay, "How did we get saddled with a patently incorrect phrase such as 'pair of binoculars?'" A few years back, I got to thinking about that phrase for the first time and decided that I would not use it anymore and would henceforth use the correct phrase... well, it's barely a phrase because I didn't need the preposition any longer, because "pair" is no longer needed, so I don't have to indicate what items make up that pair. That leaves just the single word "binocular." As in, "Let me get my binocular and we'll head out." Or, "Did you get a new binocular at the sale at the Obs this month?" When I moved back to Cape May a couple years back, I found that Michael O'Brien had also cogitated on that phrase and had come to the same conclusion. As far as I know, he and I are the only ones using "binocular" in this sense. Whether we're initiating a sea change or simply tilting at windmills has yet to be determined. A dull, gray day after a rainy night might not sound too good, but it's a vast improvement on the four inches of snow that they got in North Jersey! Yes, Cape May has gone back to wet and chilly, but there's still plenty out there for those visiting us. 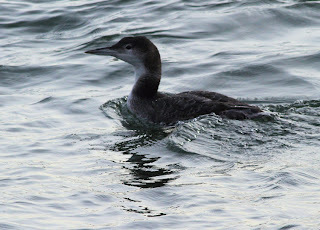 I've heard that at least 40 Purple Sandpipers and a good range of ducks are still to be found at the north end of Avalon, Red-throated Loons are plentiful all along the bayshore side and Northern Gannet flights have been very impressive for several days now. At least two Great Egrets are now hanging out in The Meadows and four Piping Plovers have returned to South Cape May Beach. This morning's first-of-season Wednesday walk at Cape May Point was not the auspicous start that we might have hoped for, but we did see a nice range of birds, including five American Oystercatchers, a good movement of Northern Gannets and single Osprey and Eastern Phoebe, the last two being first-of-years for some folks. At the Northwood Center, the feeders still continue to attract up to 25 Northern Cardinals, which make a fine sight when all sat in the bushes! Gail Stern, Tony Leukering and I also watched a male Pine Warbler nosing around the feeder at the front of the building. Also from the Northwood windows, Red-bellied Turtles are now becoming a regular sight in Lake Lily, while a Red-eared Slider there on Monday must have been a liberated pet as this species is not native this far north. Finally, more Wild Turkey reports from the region included three seen by Gail Stern at the southern end of the parkway and - most unexpected of all so far - one reported to us by Dave our UPS delivery man, seen at the west end of Alexander Avenue, right here at Cape May Point! A plethora of emails reporting American oystercatchers to me over the past two or three days reminded me that I hadn't flagged up the fact that small numbers had been trickly by over the past week. Just twos and threes so far, but more will come. Reports have been received from Sea Isle, Avalon, Stone Harbor and South Cape May. Deb Shaw also reported a Tricolored Heron at Sea Isle on Sunday which looks like being the first of the year at Cape May. These two pictures of American Oystercatchers bathing at Avalon last Friday were sent in by Beth Polvino - nice pics Beth! And while I'm putting up pictures, I'll put up this one, which I've had for a while from Karl Lukens but haven't found a spot to post it in! Poor old Red-bellied Woodpeckers are often derided for not living up to their name but - as you can see - if you get the angle right, they have got a red belly!! A few late items of interest today, in what seemed to be a fairly quiet day here, despite nice weather and - no doubt - plenty of eyes out scanning the skies. Bird of the day was a Cliff Swallow doing circuits of the Cape May Point State Park parking lot, while a late afternoon check offshore revealed a great passage of Northern Gannets with Sam Galick reporting 1,016 passing St Mary's in a 40-minute period. 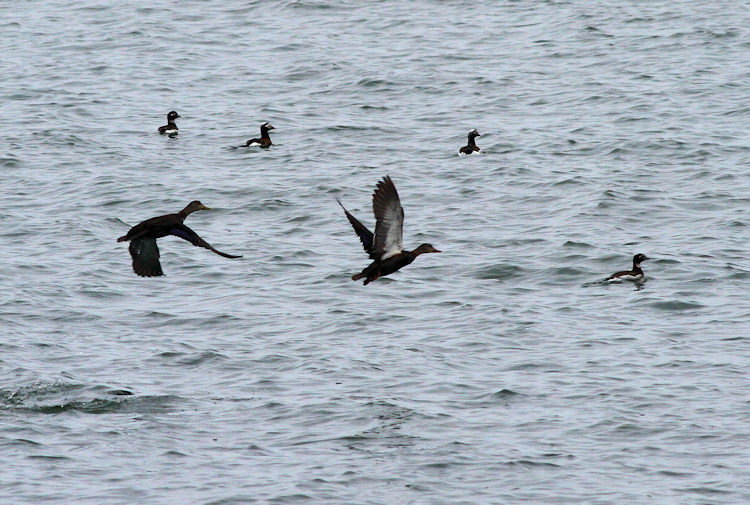 Dave Lord reported a Glossy Ibis at Heislerville late Saturday, but no news either way of the Eurasian Teal recently. Indoors is no place to be on a fine sunny day in March, so Tony Leukering and I had already hatched a plan to go 'bugging' in the north of Cape May County. The drive from my house to Tony's is through urban habitat pretty much all the way, so I was a little surprised to chance across a gathering of 13 Wild Turkeys on a private lawn along the route that I took!! Our departure from Villas was stalled a while after Tom Reed reported a Cackling Goose coming in over Cape May Point with Canada Geese - but it didn't come our way. Spending the morning at the usual sites around Jakes Landing, Belleplain State Forest and Head of the River, we can report that Pine Warblers a-plenty are singing in suitable habitat throughout the area. I heard an Eastern Screech Owl call several times along Jakes Landing Road while Tony was photographing an Osprey carrying nest material out on the marsh. Ring-necked Ducks were staging on pretty much every pond we passed and Glen Davies joined us for most of the day. Messers Reed and Galick beat us to Heislerville and put out news of the Eurasian (Common) Teal which continues there. The bird favors the first empoundment on the left as you arrive at the site, though by the time we arrived a Bald Eagle (we saw two there) had flushed most of the birds out onto the tidal mud and after much searching we did manage to find it out there. Good numbers of Dunlin are building up at Heislerville, along with a scattering of Greater and Lesser Yellowlegs - more to come, I'm sure. Two Tree Swallows were near East Point this afternoon and David LaPuma reported a good Northern Gannet movement in Delaware Bay. The bulk of today belonged to the butterflies though; Blueberry Azures seemed to be puddling along most dirt roads in Belleplain and we recorded a good scattering of Eastern Comma, Question-mark, Mourning Cloak and at least two Spring Azures; a five-species day! Will Kerling also reported to me that other butterfly chasers in the county added Small (Cabbage) White to the list as well as more of the species that we recorded. Warmth + Sun + Weekend Ahead = Fun! Well, it's time to stop saying Spring is coming - it's here! The clocks have gone forward, temperatures are up in the 60s and the grass is looking green at last. Bird continue to trickle in to Cape May; Great Blue Herons and Great Egrets on the move, Turkey Vultures getting itchy feet and soaring around the point, I finally found myself a Tree Swallow from the Hawkwatch Platform lunchtime and butterflies seemed to be sunning themselves all over the place. Tom Parsons reported a probably female Eurasian Wigeon at Lighthouse Pond this morning - though my lunchtime walk there came just after a Bald Eagle had passed over so the species still eludes me this year! A few Ring-necked Ducks and Northern Pintail linger at the state park, but the lawns are covered in parties of American Robins. The Purple Martin boxes have been put back into place after their winter clean-up (huge thanks to the volunteers who take care of that every year) - and thanks also to the crew who have been erecting bluebird boxes at various parts of Higbee's Beach WMA over the last couple of weeks. Karen Johnson called to tell me that she had heard at least eight Pine Warblers singing on the road to Jakes Landing today; it's a great time to get out to Jakes Landing Road or Belleplain State Forest to listen for this species whilst little else is singing. There is much individual variation in the songs of Pine Warblers and its interesting to see how many different versions you can pick up on before too many other birds arrive and muddy the waters. Karen also told me that, as at Cape May Point, 'anglewings' (a generic term for Question-mark/Eastern Comma when you don't quite get a good enough view to determine the species) were on the wing in good numbers at the north end of the county, and she also told me of the first Spring Azure on the wing that I had heard of this year. The forecast for Friday looks great, Saturday could be wet; so if you can manage an 'early' weekend, I'd make the best of it! Pelagic birding is on my mind right now, not least because I STILL haven't seen a Razorbill - or for that matter an auk of any kind - in Cape May County!! Tom Reed has been spending a lot of time down at Cape May Point of late and getting some good counts of birds that have ventured inadvertently into Delaware Bay, but if you really want a good chance of seeing these tricky birds, you really need to head out on a boat. As well as Tom's counts from dry land, I was sent the following information today - sounds like it's going to be a good trip to be in on! As part of New Jersey Audubon’s week long celebration of CAPE MAYgration, an overnight pelagic trip is planned for Thursday, May 19/Friday, May 20 departing from Wildwood Crest, NJ. Pelagic birds aren’t usually found close to land, spending much of their lives out at sea, which is the only way you’ll see many of them without a long haul to the Southern Hemisphere! Target species for this trip include Greater, Sooty, Manx and Cory's Shearwaters, Northern Fulmar, Wilson's and Leach's Storm-petrels, South Polar Skua, Pomarine, Parasitic and Long-tailed Jaegers, Red and Red-necked Phalaropes and Arctic Tern. Also Fin and Pilot Whale, and Risso's, Common and Atlantic Bottlenose Dolphin. If you are seaworthy and anxious to get these amazing open-ocean wanderers on your list, consider registering for the CAPE MAYgration Pelagic and bird with some of the area’s best pelagic leaders - Paul Guris, Mike Fritz, Tony Leukering, Tom Reed and Scott Barnes. The 110 ft. Atlantic Star has a large enclosed cabin and restrooms for both ladies and gentlemen and a large sundeck with seating on the upper deck. This is an overnight trip without bunks; be prepared to sleep on benches or the floor. The boat leaves from the dock in Wildwood Crest, NJ at 11 PM on Thursday evening and plans to be off the edge of the Continental Shelf before daybreak, begin a chum slick and work on birds as it becomes light. The boat will then proceed up the slick and work other shelf and canyon waters. Plan on returning to dock around 5 PM on Friday, May 20. Weather date is set for Sunday, May 22/Monday, May 23. Cost is $225 per person; for more information and to register CLICK HERE. Deadline for registration is April 30, 2011. One of the best things about Cape May is that you just never know what you're going to see on any given day. Yesterday's Little Gull was a perfect case, as was today's surprise Razorbill flight in the "rips." It started shortly before 10:30am, when the first five of 21 Razorbills winged their way south beyond my vantage point at St. Peter's. These were followed by another group of five, about 20 minutes later. 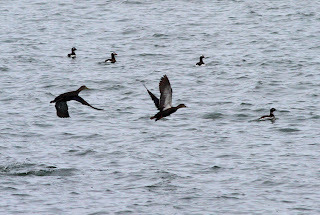 Next came a group of three, which were substantially closer and briefly put down on the water to feed with the omnipresent mass of Black Scoters just offshore. A bit of time passed before another three appeared in the distance, followed by a close group of five to finish the show. Not a bad showing for a species that is notoriously difficult to see from shore in Cape May County. This has been an excellent winter to see Razorbills from the Mid-Atlantic coast, with a massive southbound flight noted along Jersey's north shore last month, in addition to a smaller movement in mid-January. The mechanics that power movements like these aren't entirely clear, but are most likely related to a depletion of food sources to our north. And now, many of those birds are moving back north again. Today's southeast winds likely coincided with a chunk of that movement, and shifted some of the flight close enough to be seen from shore (and even pushed some birds into Delaware Bay!). Glen Davis and company reported over 100 northbound Razorbills within a few miles of the Atlantic City coastline today, as well. If you want to get up close and personal with Razorbills (and potentially other pelagic critters), then I'd suggest signing up for See Life Paulagics' trip out of Belmar, NJ on Saturday, March 26. These trips are extremely well-run, and often feature a few familiar Cape May faces as leaders and spotters. One or two reports of Ross's Geese have been floating around from Ocean and Atlantic counties for a while now, but I only just got sent pictures of them, so here are some for you to enjoy. Ross's Geese are more or less annual in New Jersey with an apparent increase in records in recent years resulting in it no longer being considered a state rarity since January 2002. This increase has been mirrored to some degree in Western Europe, where Ross's Geese occasionally show up in large flocks of Pink-footed Geese (appropriate to, mention that given New Jersey's first ever Pink-footed Goose currently lurking in Bergen County! ), though European records (and perhaps those in the eastern US too) are always potentially muddied by the escape possibilty from wildfowl collections. It's tempting to see this perceived change in Ross's Goose occurences as being in line with changes in a number of other high Arctic breeding species over the last 20 years or so. Ross's Geese, Shelter Cove Park, Toms River. These two birds have been present at this location since at least February 23rd but seemed to get a few more visitors this sunny weekend! An extra feature visible here is the classic blue bill base typical of Ross's Goose [photo by Mike Hannisian]. Ross's Geese, Shelter Cove Park, Toms River. Even though the Canada Geese are much further back, the small size of Ross's Goose is readily apparent here [photo by Mike Hannisian]. While scoping the Delaware Bay from Reed's Beach this evening, a flock of small gulls approached from the south- a welcome sight, given the general lack of anything else to look at. As the birds approached, it was evident that the flock was comprised of Bonaparte's Gulls, as to be expected. However, a more careful examination revealed a slightly different bird toward the rear of the group, featuring all-dark underwings and plain gray upperwings- an adult Little Gull! Unfortunately (for me) the birds didn't linger- in fact, in almost no time at all, the entire group lifted up above the horizon, made a few unorganized circles to gain altitude, and then boogied toward the northwest. Pennsylvania birders, you are on notice! 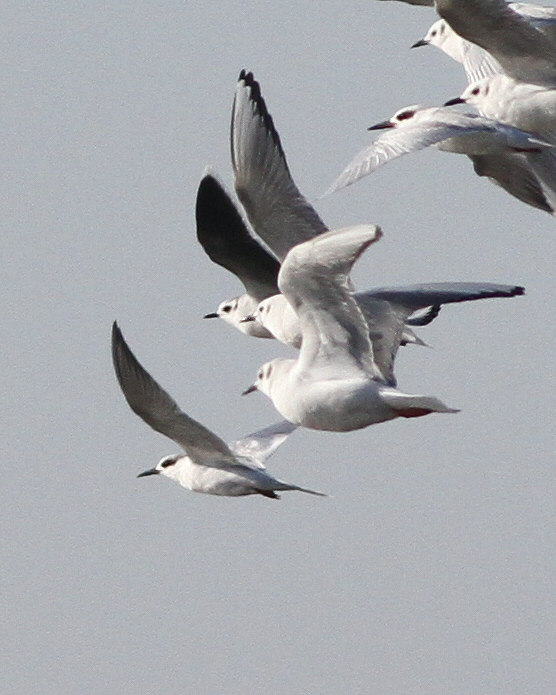 Now of course, the question arises: was this the same adult Little Gull that entertained many observers farther south along the bay on Friday afternoon, or was it a different bird? Who really knows... I certainly didn't have enough time to try to match this bird's features to the bird present on Friday, and if there's a time of year when multiple Little Gulls could be moving through Cape May, now would be it. Down at the Point! A loose 'gathering of the clans' seemed to take place today, with quite a few birders finding themselves all heading for Cape May Point and the state park in search of birds. Sam Galick and Tom Reed reported a Cackling Goose flying north with 49 Canada Geese in the morning and the same duo found a female Common Goldeneye on Lighthouse Pond mid-morning - though it appeard to have gone by lunchtime. At least two Ospreys and five Bald Eagles were noted around lunchtime too and the lakes continue to hold a nice selection of ducks - though numbers are already low now. Good numbers of American Robins can be found pretty much anywhere there is a lawn right now; last Friday's stormy weather seems to have brought a lot of earthworms closer to the surface. Cindy Ferguson stopped by the Northwood Center this afternoon with some great photos of Pine Warblers at Cape May Point State Park - she found at least six of them there so looks like they're heading back to the breeding grounds. Another one of Cindy's photos of a Pine Warbler at the state park. If you're looking for early Pine Warblers, don't forget that they like to spend time feeding on the ground (see upper picture). Not to forget the guys in the north, Dave Lord reported a Seaside Sparrow in song at Turkey Point, Cumberland County, today and a late afternoon Osprey at Jake's Landing was called in by Karen Johnson and Janet Crawford. Just a quick note for duck seekers! I hear tell that Clay Sutton and Jimmy Dowdell had single drake Eurasian Teal (Common Teal if you prefer!) today at Heislerville, in the drawn-down impoundment, and at Bivalve - at Strawberry Avenue, east of the boardwalk. Both locations are on the Maurice River in Cumberland County. The same resourceful birding duo had the same species at Corbin City impoundments (just north of Tuckahoe in Atlantic County) a few days ago. Ducks are certainly on the move in good numbers now, so it's well worth checking any flocks you might find for that extra special bonus bird - happy ducking! Short-eared Owls and Rough-legged Hawks are still reported periodically so an evening at Jake's Landing or Tuckahoe may pay dividends. A BLACK-CAPPED CHICKADEE was observed at Cape May County Park North on Friday, March 4th, 2011. An adult LITTLE GULL was noted at several locations along the lower portion of the Delaware Bayshore on Friday, March 11th, 2011, and was last observed at a distant from Tampa Ave. in the Villas section of Cape May County. BLACK-HEAD GULLS have been noted throughout the region: one to two individuals have been noted at Miami Beach in the Villas throughout the week; one was noted at Norbury’s Landing in Del Haven on Friday, March 11th, 2011; and another individual was noted amongst a large group of Bonaparte’s Gulls at East Point in Cumberland County on Wednesday, March 9th, 2011. A drake EURASIAN WIGEON was seen on the pond on Holmes Landing Road (Off the Garden State Parkway between exits 10 & 11) on Friday, March 4th, 2011. The following are first of spring arrivals: OSPREY, PINE WARBLER, March 11th. As Mike noted in the post below, the adult Little Gull put on a sustained show on the southern bayshore yesterday; hopefully it's still around for the weekend birders to enjoy. It was first found by Chris Vogel south of the canal off Higbees Beach SWA. Mike Fritz then noted it off the north jetty at the Ferry Terminal where I just managed to get to in time to see it fly off to the north (2:50 pm). Don Freiday then found it at Miami Beach, Villas (3:17 pm), where it was present for the remainder of the afternoon. As foraging of the Little Gull (and the Bonaparte's Gulls with which it associates) is tied to the tides, the information that yesterday's high tide at Miami Beach was 1:28 pm and the low was at 7:25 pm and that today's tides are, respectively, 2:25 and 8:22 pm should be useful to those looking for the wee beastie. -- size about that of Forster's Tern, smaller than Bonaparte's Gull. It's been a mixed day of weather at Cape May today, after a hideous night of rain and wind - which has at least left many wetlands more worthy of their name after what has been a rather dry winter. Cove Pool looks good right now with at least 40 Green-winged Teal and a scattering of Northern Shoveler, Black Duck and Gadwall. 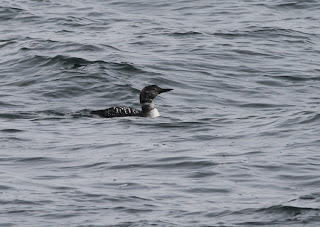 Offshore at the point this morning, a fair trickle of Northern Gannets was passing by, heading north up the Atlantic shoreline, while Red-throated Loons continue to gather on the water all around the point and up the bayshore. I could find no sign of the recent Common Redpolls - but they may still be in the area. Three female Rusty Blackbirds continue with a mixed blackbird/starling/grackle flock at the junction of Bayshore and New England while my highlight this morning was an Osprey coming in off the bay and heading north over the Migratory Bird Refuge. 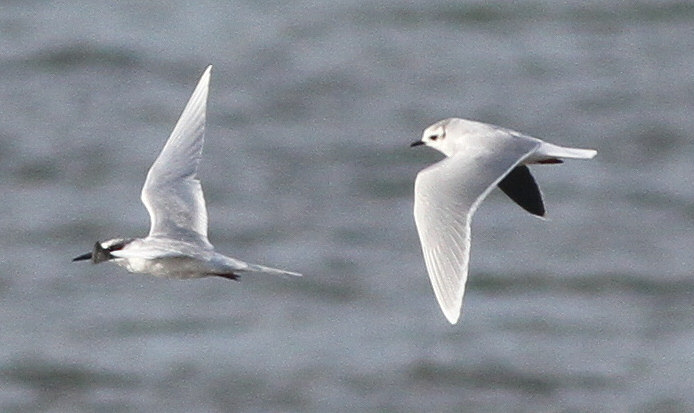 This afternoon's excitement took place along the bayshore after an adult Little Gull was seen by various people, gradually heading north up the Delaware Bay. It settled late afternoon at Miami Beach (at the very north end of Villas where a sand bar extends out from a water outflow) and was much enjoyed by a number of birders - the more so as it could be seen with two Laughing Gulls, a Black-headed Gull (a third bird for the year judging by plumage differences), a good number of Bonaparte's Gulls and a flock of Forster's Terns whose numbers seem to be growing daily now. As I write, the Little Gull is still present at Miami Beach so that could be a good place to start tomorrow morning - but don't forget the OPTICS SALE this weekend at the Center for Research & Education at Goshen. A little north of the county, Dave Lord reported a Pine Warbler in song in East Vineland today. Spot the spelling mistake in the title? Well, it's not one! One of the biggest things we get into in spring is recording the firsts of the year - the first arriving spring migrants, the first tree in flower, the first butterfly of the year... As a species which is habitually orientated towards sight, most of us use our visual abilities to build up our list of 'firsts for the year'. And yet, if we really want a more accurate account of when things first arrive back into our lives after the winter doldrums, we really should use our ears also. This was never more apparent to me than on my lunchtime walk today; getting out of my car at Cape May Point State Park's parking lot, I was immediately assaulted by a wall of noise emanating from the nearby marsh. It came from seemingly hundreds of Southern Leopard Frogs, spread throughout the whole wetland area. I say seemingly because, although I tried pretty hard, I never did see a single one! This is at least in part because leopard frogs habitually call from under water, surfacing when the coast is clear after dark. So this got me thinking about hearing things and not seeing them and reminded me that the Fish Crows I heard outside the Northwood Center a few days ago were the first back at the point - but I didn't see them; three or four woodcocks continue to call outside our house at dusk, but I haven't seen them. And just think of how often you hear a passing skein of Snow Geese, way, way overhead, which you would miss if it wasn't for the shell-likes on the side of your head. Later on my lunch time wanderings, I walked up onto the dune at the south end of the Migratory Bird Refuge and my eyes were immediately drawn to the white rump of a Northern Flicker flying up off the ground. However, ny ears were drawn to a busy twittering further away which, when I turned my head in the direction of the sound, proved to be coming from a fabulous flock of at least 30 Common Redpolls, which settled again to feed on the goldenrod seed that is plentiful at the moment. We're having a good year for Common Redpolls this year, so keep an eye out at feeders or along coastal dunes over the next few weeks. Also happening right now is the annual build-up of Red-throated Loons along the Delaware Bayshore, viewable from Sunset Beach or anywhere along the bay side of the Cape May peninsula. A lone adult Northern Gannet that struggled east past me in a strong south-east wind today also reminded that the gannet build-up that normally happens in the second half of March is due any day now! Spring: Eager anticipation of bird migration and the new bug season! Though there are, as yet, no reports of Pine Warbler around here, we expect the first any day. Though there have been a couple Laughing Gulls seen so far, they are not yet even every day occurrences. Though Josh Nemeth and I saw two Greater Yellowlegs at Ludlum's Pond (Dennisville) yesterday (these were almost certainly migrants), there has been little evidence of shorebird migration. Though ducks are certainly on the move, we've had only one report of migrant Blue-winged Teal. Though the spring tally of swallow species is four, only a couple of Cape May birders have seen any. We are at the cusp. The above and more should be arriving in numbers in the area any day now. At least one of the wintering Black-headed Gulls has initiated its prealternate molt and is starting to get a well-defined dark head. The resident birds are singing up a storm. The Great Horned Owls and Bald Eagles are incubating. Fish Crows have become daily sights on Cape Island. The temperatures are staying above freezing for long stretches. Some moths are out and about. Can singing Yellow-throated Warblers at Jakes Landing and Harlequin Darners at the Fulling Mill Road trails be far away? Come on, Spring! A GREATER WHITE-FRONTED GOOSE was discovered on Wednesday, March 2nd, 2011 in a pond on Bayberry Rd. (South of Stone Harbor Blvd, East of the Garden State Parkway). It was last reported on Thursday, March 3rd, 2011 about .25 miles south of Stone Harbor Blvd. A GRASSHOPPER SPARROW continues at Mt. Vernon Ave. (“Cove Pool”) in Cape May, and was last seen on Thursday, March 3rd, 2011. A female EURASIAN WIGEON was observed on Bunker Pond in Cape May Point State Park on Tuesday, March 1st, 2011. Two BLACK-HEADED GULLS were observed at Miami Beach in the Villas on Thursday, February 24th, 2011. A RAZORBILL was seen flying south at Sunset Beach in Cape May on Friday, February 25th, 2011. A first cycle LESSER BLACK-BACKED GULL was observed on Lake Champlain in the Villas on Thursday, February 24th, 2011. The following are First of Spring Arrivals for 2011: PIPING PLOVER, LAUGHING GULL 2/27; CLIFF SWALLOW, CAVE SWALLOW 3/1; PURPLE MARTIN 3/3. With the thermometer dropping to below 20F last night, it looked like it was going to be a pretty chilly day today, but the sun beats down and the sky is blue, blue, blue and cloudless. And that's all we need to get birders out and scouting for goodies. The last couple of days has seen on and off sightings of A Greater White-fronted Goose with a flock of Canada Geese, first reported yesterday by Tony Leukering and re-found today by David LaPuma. The bird is being seen on Bayberry Drive, on a pond just south of the commercial zone on the south side of Stone Harbor Boulevard. Bayberry runs parallel with the Garden State Parkway and just to the east of it. Stone Harbor Boulevard is Exit 10 off the parkway. It's tempting to wonder if this is the same goose that Karl Lukens found way back in the winter and which promptly disappeared. There's plenty of private ponds and grazing areas that aren't watched regularly (or at all) by birders. Common Redpolls are cropping again the last couple of days too - perhaps birds drifting back north now that the weather is improving. Birds on the track to Higbee Dike, in West Cape May (at Vince Elia's feet apparently! ), at feeders in Del Haven and as fly-overs at The Meadows as well as a group of eight at Stone Harbor Point have all been reliably reported so keep an eye (and ear) out for them. Three Short-eared Owls at Stone Harbor Point are probably birds on the move, while Sam Galick reported the elusive Grasshopper Sparrow near Cove Pond again. Nice also to hear that Chris Vogel had a Purple Martin at Cape May Point State Park this morning. Heading this way soon? If you can be here for the weekend of March 12th/13th, you could get in some good birding and pick up a great bargain at CMBO's annual - and much anticipated - Optics Sale!! A day of sunny weather (though a pretty cool breeze) brought a few treats to Cape May Point today with Jim Dowdell hitting gold east of The meadows, near Cove Pool. Here he found a fine collection of one Tree Swallow, three Cliff Swallows and a Cave Swallow - a nice little collection! One thing I forgot to mention for yesterday is that Tony Leukering's Forster's Tern count at Miami Beach in Villas reached 14 birds today. Tony also found a female Eurasian Wigeon on Bunker Pond while out scanning for swallows - about time good old Bunker Pond got a mention here! Will Kerling hit another spring milestone today with Wood Frogs calling along Beaver Dam Road today, where he also managed to get this quick shot. Other signs of spring included a couple of Fish Crow reports from south of the canal today (they've all been wintering in a mob somewhere up-county until now) and a gradual, continued increase in the bird song volume. Woodcocks were making silly noises in our yard again this evening!